Thirsty Beijingers will have access to more water in 2014 after the completion of a costly water diversion project. Their tap water will then be drawn from the Danjiangkou reservoir, created in 1958 after damming the Han River as it flows through Henan and Hubei provinces. But local farmers won’t even wash their hands in the water that replenishes the reservoir. The South to North Water Diversion project, first conceived by Mao Zedong in 1958 and finally approved 44 years later, is the largest ever planned and is meant to solve the severe water shortage problem in northern China. Water from the lower, middle and upper parts of the Yangtze River will be rerouted northward, thus forming three water diversion routes named the east, central, and west line, respectively. The total amount invested in the project will be nearly $80 billion. The project’s central line uses the Danjiangkou Reservoir as its source and will channel it to flow towards Beijing and Tianjin, with a total length of close to 800 miles. The main part of the project will be completed at the end of 2013, and the remainder in 2014. China Central TV (CCTV) said in a June 19 report that the Shending River, a tributary of the Han River, is an open sewer as it flows three miles outside Shiyan City, Hubei Province. Different kinds of garbage and animal corpses can be seen everywhere floating on the surface, while black mud silts up the riverbed, and the whole river emits an unbearable stench. Shiyan City does have a municipal sewage treatment plant but nearby residents told CCTV that the sewage from Shiyan City isn’t processed at all and instead is directly discharged into the Shending River. The treatment plant releases black sewage water into the river two to three times on average per week via a secret channel, they say. The odor is extremely offensive, and this sewage water quickly dyes the downstream water black. The Shending River converges with the Han River and eventually flows into the Danjiangkou Reservoir a few dozen miles downstream. Residents there said that not only do they dare not use this water to irrigate crops, they won’t even wash their hands in the river, and merely stepping into the river causes their feet to itch for a few days. In July 2012 the Shiyan City government website published a report titled, “Comprehensive Treatment Plans for Below Standard Rivers.” It noted that the Shending, Qiang, Si, and Jian Rivers, which are the four tributaries of the Han River, have all been categorized as “Inferior Level Five.” Ground water in China is categorized into five categories for use. “Inferior Level Five” means the water is below standard for use in agriculture irrigation and sight-seeing. 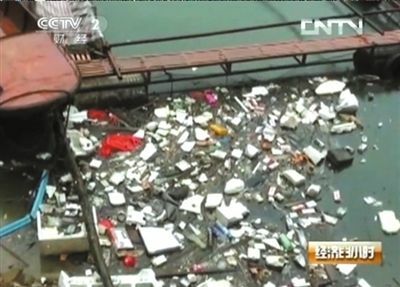 A restaurant owner in Ziyang County told CCTV that all the restaurants along the river dump their sink waste and toilet sewage directly into the Han River. Other residents said there is no sewage processing plant, and dumping sewage right into the river is a common practice. In addition, the solid waste landfill factory is located right along the river, so when it rains, rainwater along with the garbage flows into the Han River. Some residents called the Han River Ziyang County’s septic tank. The diversion project will send this water to Beijing. Zhao Zhangyuan, a researcher at China Research Academy of Environmental Sciences told CCTV he worries that after the diversion project is completed, the rerouted water will in actuality be sewage that will bring disaster to Beijing. While the diversion project has been touted by the Chinese Communist Party for decades, experts have continually questioned it. At the end of 2012, Wang Weiluo, a hydraulics engineer who now lives in Germany, made an assessment of the project, saying it violates the fundamental principle of sustainable development. The source area cannot provide such a large amount of water, and the damage the project brings to the ecological system is worse than the Three Gorges project, Wang said. Furthermore, the population that must be relocated is far greater than had been anticipated. Translated by Jenny Yang. Written in English by Gary Pansey and Gisela Sommer. Heavy metal contamination of farmlands is preventing rice sales in Hunan, China’s No. 1 rice-growing province, and is a nationwide problem.